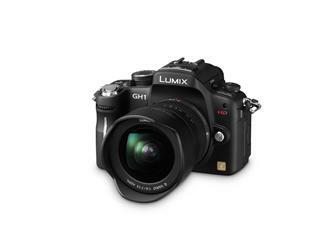 If this isn’t one of ther best cameras to come out of Panasonic in recent years then I don’t know what is.It takes gorgeous stills and this thing is made for video.No mirror to worry about,great sized sensor for increased control over depth of field but I am disappointed at the codec.It has been described as turning to mud on panning.So in a nutshell – keep it still and you get good results – move the baby and it isn’t pretty.At least for someone like me who has been capturing through the HDMI port of camncorders for years I can only see this as deliberate crippling. Allow me to suggest that this is short sighted and Pana are shooting themselves in the foot.I know that Panasonic have a high end video line to protect … but would one rather sell 20 000 £20 000 high end cameras or 500 000 £1000 cameras? Anyway that is not the biggest issue.Canon have kept their train moving forward with the 7D.Now buyers can have great abundant glass and three cameras (5D,7D,1D) that shoot amazing video to a great Codec.Nikon are breathing down everyone’s neck and RED are about to turn the market upside down at the end of October.As far as DSLR video goes Sony are also party pooping by basically not even showing up yet.But then again – with them your looking at perhaps £200 000 for the privilge of having an F35 that gives you interchangebale lenses on a 35 mm format camera.I reckon that when they join the party they can and will surpass everyone else.WHY get left behind when you can be leading the pack? For Panasonic to rain on the VDSLR Parade (even though the GH1 is not a DSLR) they should set this puppy free.They can do this by allowing users to record the HDMI output live pre compressed to a Codec of their choice.This will see people flocking to buy this baby.I already own it and for stills it is amazing but it’s video has a lot more to offer.I don’t buy the sentiments that it cannot do this and record to the codec at the same time either.I am no engineer but my three year old HDV camcorder can do this without breaking into a sweat and Pana brag about how powerful the engine is.Okay then turn off all the power hungry processes and just pipe the data through to the HDMI pot instead of to the encoder.SIMPLES. One of the greatest assetts of this puppy is its ergonomics.It is compact,has an articulating LCD screen and has interchangable lenses on a large sensor.What more would an indie film-maker want.This thing can go on a steadicam merlin and with that you are set to make blockbusters.Oh you also need a good story,good actors,a good DOP,sound tech,great director,good lighting ……….you get the picture anyway. I have read of many people on professional video forums who returned the GH1 in frustration because of the codecs limitations.I am not saying it is rubbish – just not what it should be.If Pana sit on the fence on this one they will continue to see many leave after the better offerings from the market and this need not be the case.RED have shown the way to do business.Keep your loyal customers happy by improving their existing product with firmware upgrades and then give them a huge incentive to go for your next big product.Canon have realised this too and in this economy ( and Pana have already been affected by it – they laid off a few people early in the year) people just aren’t going to keep buying the next thing you put out with a small incremental upgrade. Firmware upgrade Pana….Uncompressed HDMI??? ?Pretty please.